March 2017 – Concurrent Technologies, a leading supplier of boards for critical embedded applications, announces a 3U VPX™ computing board with significantly improved capabilities for server grade applications within the defense, transportation and industrial markets. TR G4x/msd boasts an Intel® Xeon®processor with up to 64Gbytes of soldered Error Correcting Code (ECC) DDR4 memory. This doubles the current benchmark of 32Gbytes, established by Concurrent Technologies’ existing TR C4x/msd board, within the same Size, Weight and Power (SWaP) envelope. 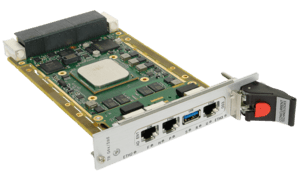 Rear connectivity includes dual Gigabit Ethernet for control, dual 10-Gigabit Ethernet for data and a x16 PCI Express® pipe for direct connection to GPU and FPGA accelerators. This mirrors the architecture found in high performance server solutions, but in a package suitable for deployment in long life-cycle, challenging environments. 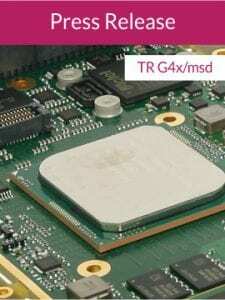 TR G4x/msd is a 64 or 128Gbytes Solid State Drive (SSD) module that is designed for use in hostile environments. Additional on-board mass storage options include a 2.5-inch SSD or up to two M.2 module adapters. 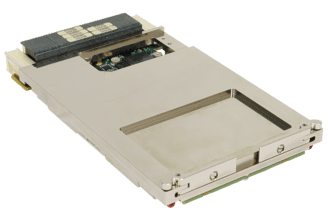 The 2.5-inch SSD connects to the front panel I/O module and is a solution for high capacity, air-cooled deployments. 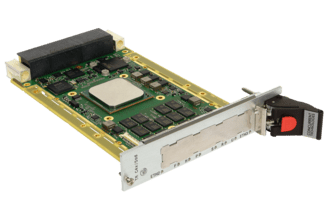 For air and rugged conduction-cooled environments, the M.2 adapters fit directly to the base board via higher speed PCI Express® connections and utilize the NVMe protocol which is designed to work best with solid state drives. Various RAID modes are supported when using a pair of M.2 modules, offering application performance and reliability options. The Intel® Xeon® processor D-1500 family used on TR G4x/msd is available with up to 16-cores, enabling board variants to be optimized for high compute performance or lower power consumption. Concurrent Technologies’ default variant uses the 12-core D-1559 processor matched with 64Gbytes of memory for extended operating temperature applications. Shipments of the air-cooled variants commence imminently with rugged conduction-cooled boards expected later in 2017 once all the additional environmental tests have been completed.